Today I had a client that came to me that liked a web part that I had developed and wanted me to install it for them with some slight mods. No problem… Ohh wait, we developed that for SharePoint 2010 using Visual Studio 2010. 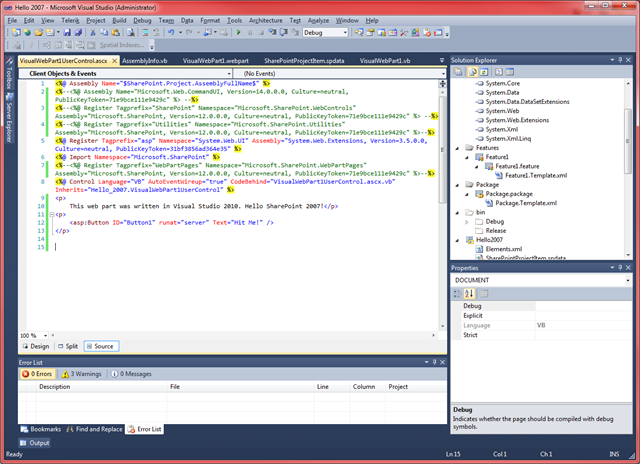 I am a huge fan of Visual Studio 2010 and its tight integration with SharePoint 2010 in its ability to quickly create features and write code like its supposed to be written (without the major headache!). 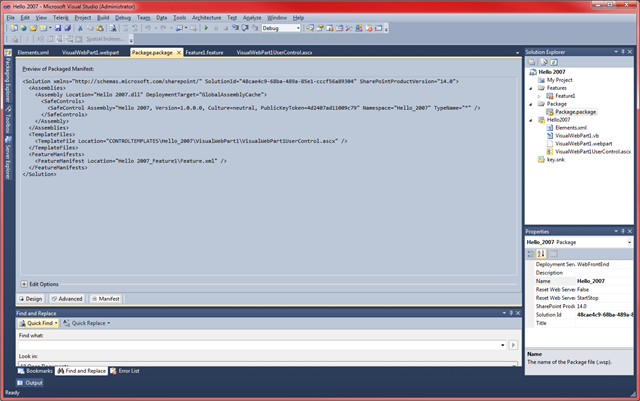 Although WSPbuilder was the tool of chose for SP 2007, VS 2010 is now my new favourite weapon. With new functions like creating Visual Web Parts in a couple of clicks, features, deploy & debug with F5, control over deployment and much more. Its fantastic, well done to Microsoft for making what should be a simple job easy again! Since the release of SharePoint 2010 I now do a lot my development in SharePoint 2010 even if my client is running on SharePoint 2007. Why? Well because the API’s for SP 2007 & 2010 are very similar, and really haven’t effected much of my development to date. I find it so much easier to development in SP 2010 with Visual Studio 2010 especially when I run Windows 7 64-bit with SharePoint Foundation 2010 installed. Having this setup means that i can deploy directly from my local PC to a SharePoint environment for basic testing. No need to manually create project structure, manifiest files, signing of assembly, building wsps, manually deploying, attach to debug etc. Once I’m all done with development I package it up and deploy the wsp to the Sharepoint 2007 development for thorough testing. Provided I haven’t used any deprecated methods in the API, ill be all sweet. Good thing is if you have used and deprecated methods you wont be able to build solution, so you wont be doubt when deploying to SP 2007. So i presume your reading this because you love the new Visual Studio 2010 but need to develop web parts for SharePoint 2007. 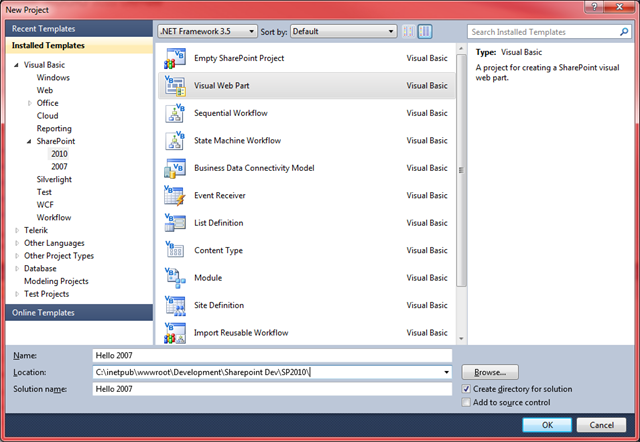 Although the interface within Visual Studio doesn’t directly enable you to develop for 2007, it is possible with some minor changes to your project. Write your custom web part. I have just created a simple web part that contains some text and a button. When the user clicks the button the button text will change. 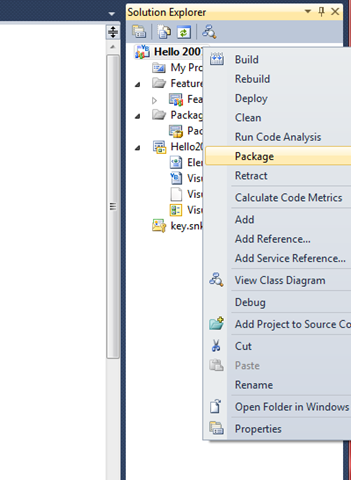 I now press F5 on the keyboard and Visual Studio will automatically build & deploy my web part to SharePoint 2010. I confirm it all works by adding the web part to the page. Great! But there is nothing special so far. So we need to package up the solution. Copy to SharePoint 2007 server. Deploy to 2007 env and we get an error. The error tells us that it found a version number in the manifest that it doesnt understand. “Solution manifest for solution ’48cae4c9-68ba-cccf5a89304′ failed validation, file manifest.xml, line 2, character 110: The ‘SharePointProductVersion’ attribute is not declared. 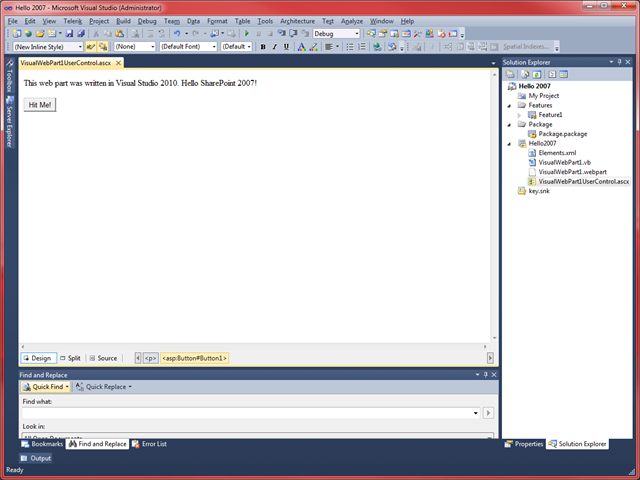 Go back into Visual Studio 2010. Select “Manifest” down the bottom. Notice where is reads SharePointProductVersion=”14.0” in the xml file. 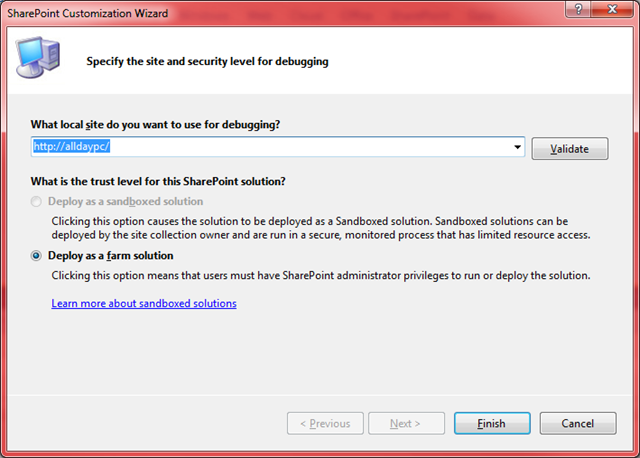 In the properties panel, clear out 14.0 in the SharePointProductVersion field. This removes the property all together from the manifest file. We also need to change the assembly reference in the project from Microsoft.SharePoint.dll 14.0 to 12.0. To do this you will need to click the show all files icon in the solution explorer panel. Because we have built a ‘Visual Web Part’, Visual Studio 2010 automattically adds some imports into the ascx user control file which wont exists in SP 2007. Therefore you need to comment these references out. Obviously if we were doing a coded web part or a event receiver we would not need to do this step.Mine currently looks like this. Package up your solution again and deploy on SP 2007 environment. Active, test and your good to go. You will need Asp.Net 3.5 installed on your SharePoint 2007 environment. This may not always be the right solution for you (depending on your project) but it certainly saves me a lot of time for those basic web parts. your blog is very good and you have given very good explanation. But now i dont have any SP 2010 machine with me and has SP 2007 with VS 2010. 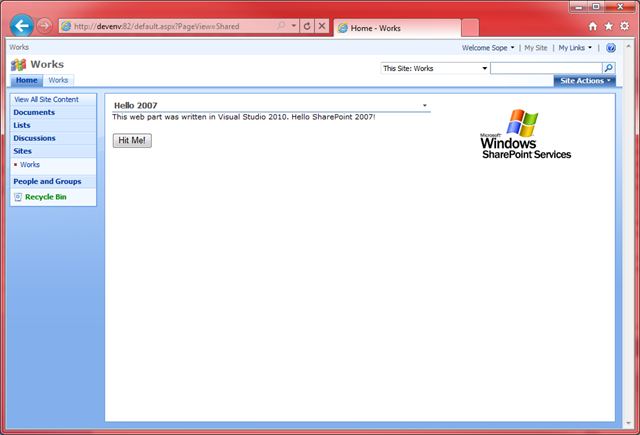 Can you please tell me how can i create a webpart for SP 2007 with VS 2010?